Someone said this to Liz MacPherson when she took on the top role at Stats NZ three years ago. 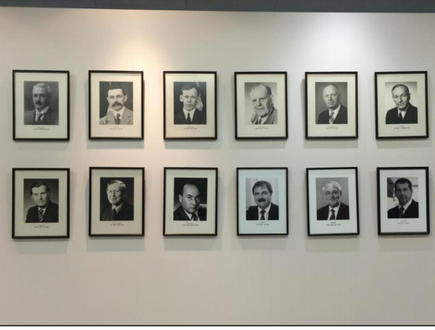 And, indeed, the wall in her new office was filled with photos of her predecessors, all males. 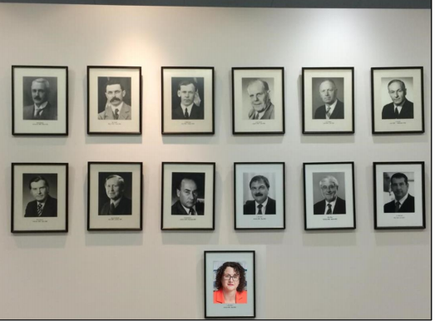 You only get a photo when you leave, explains Liz MacPherson on why her photo is missing on this wall. She is breaking new ground, as one of the growing number of female government CEOs in New Zealand and being the first female CEO at Stats NZ. 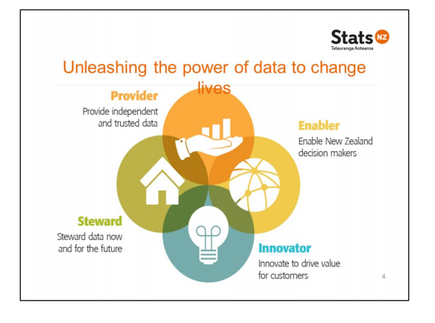 “A real focus for us at Stats NZ and the government as a whole is how can we turn the asset, which is government data, into something that can really drive value for New Zealand, both by government and the private sector." At the SAS Users New Zealand (SUNZ) Conference in Wellington last week, MacPherson discussed the programmes Stats NZ is working on to achieve this. She cites a recent cover story in The Economist about data, not oil, being the world’s most valuable resource. “We are absolutely focused on unleashing the power of data to change lives,” she says. “To do that, we have to focus on on unlocking that value through use of new technologies, through building the capability of our people and the people across the system, to be able to use the data. She says there is no shortage of challenges for the agency and the community of data professionals in New Zealand to achieve this goal. 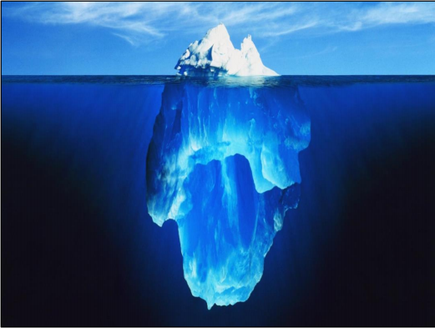 She says one of the challenges Stats NZ faces as it leads data across the state sector is the ‘data iceberg’. Sitting above the waterline is some of the data people have current access to, she says. These are often in the form of reports. ''Even if the data sits above the waterline, we have to make sure it is accessible and in forms that meet open data standards. ''Below the waterline is data less accessible for a variety of different reasons," she adds. “We are constantly looking for ways we can improve access to that data. How can we allow people to see it, use it, but do it in a way that keeps it safe, [and] maintains trust and confidence of the people who have given the data to us? 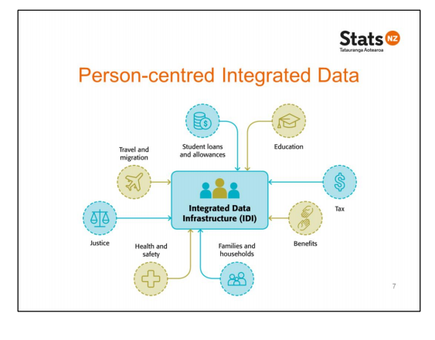 As an example, she cites the Integrated Data Infrastructure (IDI). The IDI is the largest research database containing microdata about people and households. The data comes from a range of government agencies, Statistics NZ surveys including the 2013 Census, and nongovernment organisations. According to Stats NZ, the IDI holds more than 166 billion facts, taking up 1.22 terabytes of space. Researchers use it to answer complex questions to improve outcomes for New Zealanders. MacPherson says the data collected is critical to the work being done by government agencies such as the Ministry of Social Development and Ministry of Justice. She says the social sector uses the Integrated Data Infrastructure. One of the projects she identifies using IDI was an app that helps students know how much a course will cost and how long it will take, to guide them in their career decisions. There are other diverse projects involving cardiovascular risks and mental health-related issues, she says. 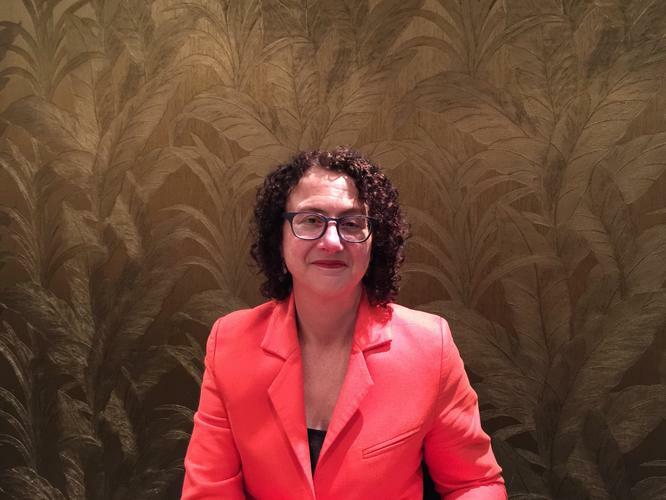 She says nongovernment organisations are putting their data into the IDI, so they can better understand their clients and the outcomes they are achieving for their clients. “How do we work with those NGOs to build the trust and confidence to have their data in the system? 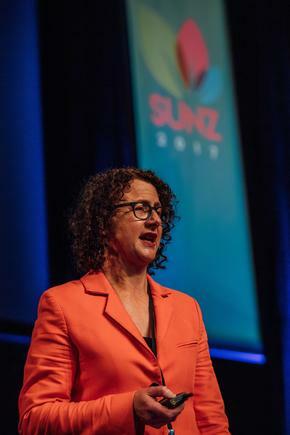 “This data set is quite literally the envy of most of your colleagues in other countries ... there is nothing like it elsewhere globally,” she tells delegates at the SUNZ conference..
“We are very proud of it but we want you to get even more use out of it." MacPherson considers, "How do we make it faster and more accessible? For instance, this could be through the use of technology to authenticate the user, a researcher, and the level of data they can access. As well as taking the processes to the data, and improving analytical tools." She says the data is appropriately cared for using the ‘five safes’ model. The 'five safes' model ensures Statistics NZ provides access to data only if all of these five conditions are met. This means access to data is provided only after five conditions are met and these include researchers passing referee checks. As well, the research project has to have a statistical purpose and is in the public interest, and the statistical results produced do not contain any identifying results. “We make no apology for the fact that we put a lot of effort to keeping the data safe,” she says. “It is important to be able tell people of how we are keeping that data and at the same time creating a tension about opening it up, making greater access, so we derive greater value for the people of New Zealand and at the same time we maintain their trust and confidence. She cites another data-driven project that is providing benefits to the community. The Canterbury District Health Board has a large number of data from individuals who agreed to share the information with healthcare providers. Thus, when a patient turns up at an A and E in Christchurch, the staff will know what medication they are on and other information that will allow them to provide better treatment, she says. 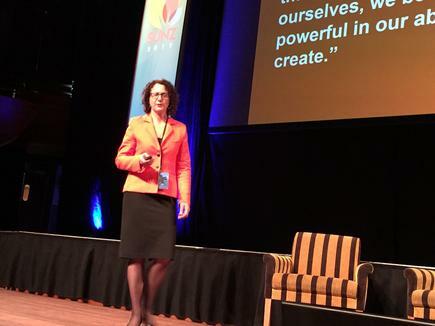 She says New Zealand is one of the top 10 countries in the world for the openness of its data. “But we can do better. The definition of open data is not just the fact that it is sitting there on your website, it is the fact that it is machine readable. “Open data is good for democracy, it is good for innovation in terms of the contest of ideas,” she says. It is from Jack Delosa, CEO and founder of The Entourage, considered Australia's largest and most disruptive education institution. “I do take this quote quite seriously,” she says. Read more CIO upfront: Mindfulness as the key to project performance? She believes this is also true for data professionals at Statistics New Zealand and across government. “The purpose is to unleash the power of data to change lives,” she states. “If data stays locked in our vaults, your vaults, it is not going to change lives, it is not going to improve the lives of New Zealanders. MacPherson says Stats NZ is also at the leading edge in using technology as a service. "We used desktop as a service, telco as a service, and effectively set up building as a service at The Christchurch Integrated Government Accommodation Programme." Stats NZ is the lead agency in the building, and all of the tenants use a co-located arrangement where they run off one set of systems. She is cognisant of the need to be developing the teams that will work on an increasingly big data environment. "For us the challenge is to augment the statistical skills we have with the other skills that are required in a big data analytical environment," she says. Read more What is the UK government's open data strategy? "That tends to mean a blend of statistics with computer science and as well the ability to think about how to release stories from the data. It is about communicating as well. "These are the things we are focusing on in terms of building capabilities within the organisation and recruiting." 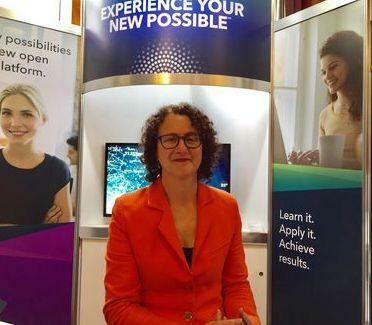 MacPherson speaks at industry conferences about the opportunities for people working in data analytics. “This is the time of data analytics,” she says. “There are huge opportunities to take your skills, take them to the next level and really add value. The career opportunities are really significant for people with data analytics skills right across government and in the private sector. We look at places like Google, Amazon, SAS and Microsoft… How are they organising themselves? What boundaries are they pushing? She cites the work being done by Dr Michelle Dickinson aka Nanogirl, Figure CEO Lillian Grace and Tech Futures Lab founder Frances Valintine. She also talks about leadership, with a particular focus on diversity. MacPherson has been in government for more than two decades, working at senior leadership levels in the past 10 years. These include the Department of Labour, the Ministry of Economic Development, and more recently the Ministry of Business, Innovation and Employment. “If you have diversity around your board table, you will get better outcomes because you have different ways of thinking with different lenses on the world. She says this diversity of thinking was also harnessed during the recent hackathon at Statistics New Zealand, which had participants like developers with different backgrounds, and from technology companies. MacPherson talks about expanding the department's network of data professionals across the globe. Statistics NZ has signed a memorandum of agreement with its counterpart in the Netherlands to strengthen the way both agencies gather and use data. “We want to move to real-time information, to lower levels of aggregation, because we know people want to understand themselves and their communities more, and that means using new and different forms of data. ''We look at places like Google, Amazon, SAS and Microsoft,'' she says. “How are they organising themselves? What boundaries are they pushing? We think about how we might partner in order to deliver [data value] for New Zealand. “We can not achieve the goals we have for really increasing the value that New Zealand is getting from its data, without partnering,” MacPherson concludes. Liz MacPherson of Statistics NZ: "If you have diversity around your board table, you will get better outcomes because you have different ways of thinking with different lenses on the world."